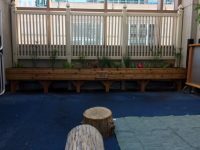 Our outdoor classroom is unique because it is placed on the roof of a building in the heart of Minneapolis, MN. 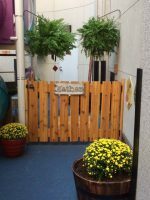 We have tried to add as much nature as possible through hanging plants, planters and a raised garden box. We also added many local natural materials such as pinecones, wood rounds, grasses, shells for the children to explore. The entry feature is a gate opening to a bridge to the classroom. 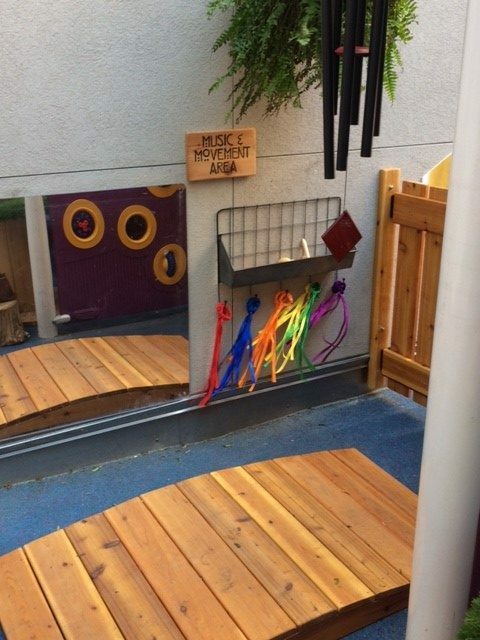 Once inside, the music and movement area is filled with instruments, ribbons, scarves and a large mirror to enjoy their own performances! 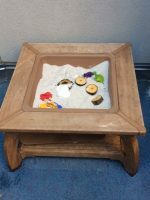 Next is our sand area with seashells, wood rounds, pinecones, dinosaurs & construction trucks. Right in the middle of our space is the gathering area. This area consists of an easel, a Nature Explore blanket to pull out and enjoy, as well as a few logs and stumps bordering the space. The gathering area can be altered to make more room for art, as our art wall pulls out into this space when more room is needed. The art area has paint, markers, paper, etc. available, as well as seed pods, seashells, wood rounds, pinecones, for exploring, patterning and creating. Next to our art easel is our raised garden box. 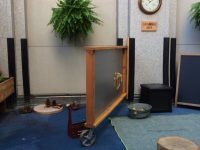 It holds a large selection of tall grasses and plants, as well as watering cans for the children to use. The block area is next with many different wood rounds, pinecones, seashells, cones, CDs, etc. 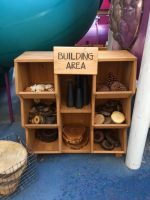 We also have a small world play area offering smaller shells, beads, animals, and wood pieces for the children to create. The climber offers us many opportunities to climb and leads us to our open area. At the end of our open/action area, is our messy materials space. 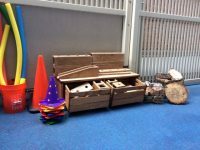 This consists of the outlast wood block set, large and small wood rounds and chunks, cones, pool noodles, ramps and balls.